Who says you can’t bike commute in the snow? 1. Winter training, Alaska style. 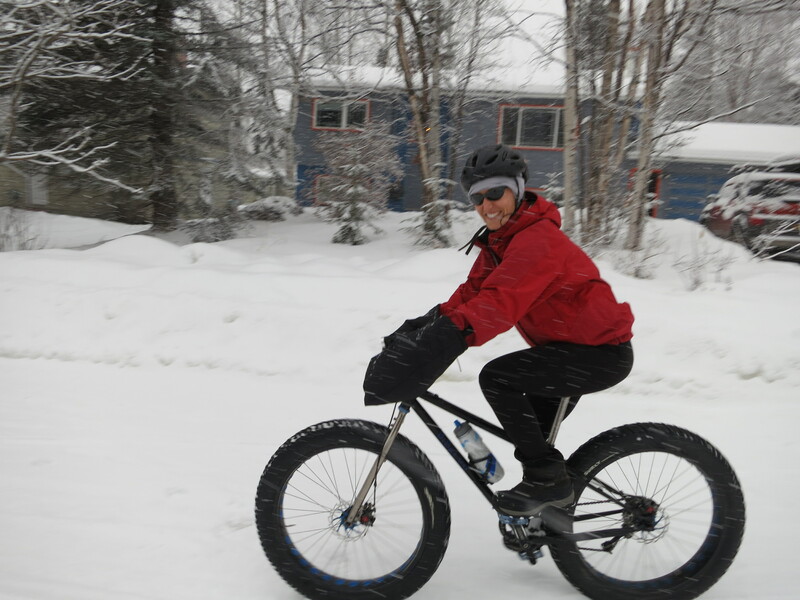 Our friends in Anchorage tracked down a fat bike for Peter’s long legs and on our first full day in the far north we all enjoyed riding through fresh, falling snow. Probably about 5 inches came down over the course of the day, making the conditions especially forgiving for us outsiders. How’s that for keeping up with my training routine while on the go? 2. Yurt deja vu. As we skied into the Eagle River yurt, I started to have flashbacks to my grad school on a bus…and realized that we had spent a week at Rapids Camp, which we then passed on our way to the Yukla yurt. I remembered tent placements and early-morning yoga in the yurt with my AEI cohort, but honestly…not much else. At any rate, the yurt was lovely and the mountain views amazing. 3. A birthday in a wilderness cabin. We forgot candles, so Peter’s 40th was celebrated with a flaming vegan cupcake. I don’t think he minded at all! Pulling our gear in sleds felt a little like river rafting – we had cans of beans for burritos, two packages of Newman-O’s, about five pounds of oatmeal and oatmeal additives, three pounds of pasta, and ridiculous quantities of snacks. And – of course – beer. 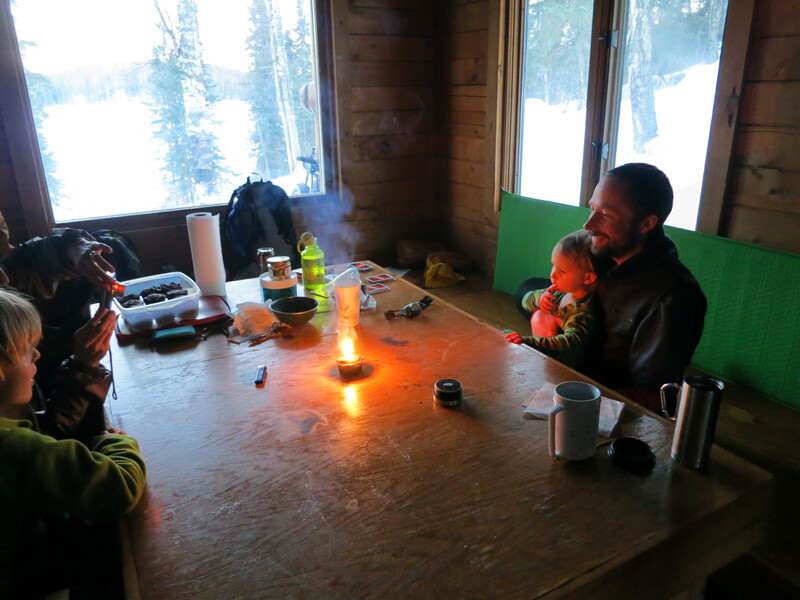 I spent most of the trip drinking hot water with honey (see below) but the rest of the crew skied, fat biked, and sledded from warm (aka, when the sun got the temp above zero in the morning) to dark (aka, when it started to get dark and really cold again). In March, it’s light past 7:30 p.m. here so we had a good amount of daylight, but nights are still cold. This morning the thermometer read -6 when we all roused ourselves around 8:00 a.m. Unfortunately we had some wood stove issues so we packed up a little quicker than anticipated…but not before little A got some sledding in. 4. Snow! Probably for the last time in 2013, sniff sniff. 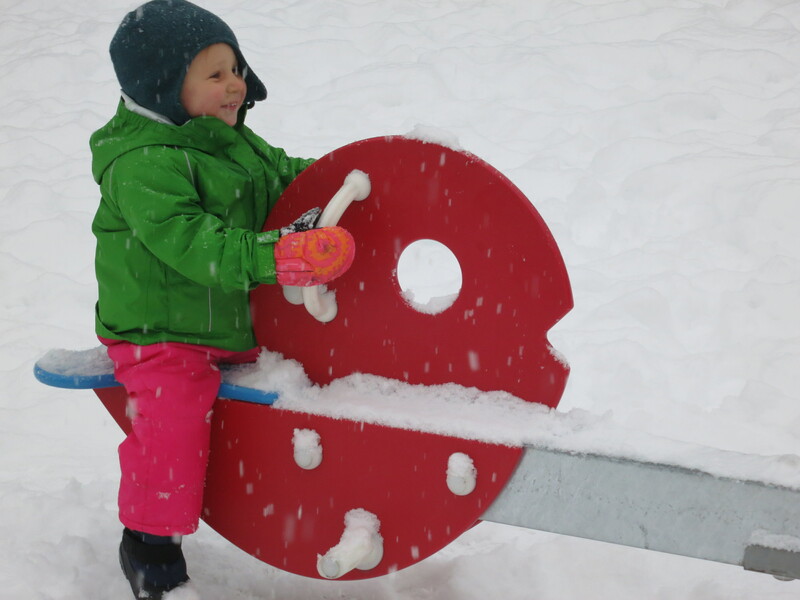 Little A loooooves snow – for the weeks leading up to the trip, she’s responded “Snow! !” every time we reminded her we were going to Alaska. From our first trip to the snow-covered playground to setting the distance record for sledding at the Bald Lake cabin (she and I were the lightest combo so we slid the farthest across the lake), she’s been unstoppable. She is definitely Peter’s child. 5. Good company, good food, good times. Every time we come up to Anchorage we end up spending a while discussing whether or not we should move north, and I think it’s at least 50% because we click really well with Pam and Carl. There are not so many other folks we know who are willing to do the work to take a whole family out into the wilderness – especially not in winter – and who are unabashedly enthusiastic about epic outdoorsy stuff. We’re all vegetarian which makes cooking together very easy, and pretty well aligned on parenting (I’ve been skimming Simplicity Parenting while here and I think I may have to get myself a copy…and finally toss all those useless sleep books). If anything we find it hard to keep up with their energetic days! The one day in between trips, Peter and Carl went for a 22-mile ski traverse (birthday slog for Peter) while Pam and I took the kiddos shopping, out to lunch, home for nap, and then met friends at the Alaska Zoo before taking all four kids home and cooking dinner and making cupcakes. We were both pretty beat by our respective agendas! The one downside was that I came down with some sort of feverish illness that lasted pretty much the entire duration of our cabin trip – starting with slight chills as we left Anchorage (with a stop at Fred Meyer for some acetaminophen) and just now relaxing into a lingering sore throat. This hit me last month and I’m a bit perplexed by getting another multi-day fever…but I took it easy in the cabin and am hoping it won’t keep me from the promised girls’ epic ski tomorrow! It is going to be hard to come back from this vacation. I anticipate another round of “Should we move to Alaska” conversations over the coming months. What do you think?